This year on 18 and 19 November The Dowse is hosting the annual Curator's Hui, a chance for people working in (and near!) museums and galleries to share ideas, updates, case studies and emerging trends. The first call for proposals closes TODAY. We are offering a range of talk formats (from 10 minutes to an hour) and the list of topics we're interested in is long and diverse. All the relevant info is available on our website, and if you're familiar with the hui and want to dive straight into submitting your proposal, there's a handy dandy online submission form here. Behind the Financial Times registration wall (hand over an email address and some "details" for access), a lengthy article about the history of design museums (starting with the didactic impulse behind the first, the V&A) and their current status, as directors and curators deal with the digital age and the sense that design might actually be in and of everything. On the radio this week I talked about three ceramics shows at Dunedin Public Art Gallery: The Dowse's touring Barry Brickell exhibition, Paul Maseyk's solo show, and Madeleine Child's contribution to a group show of work by Dunedin artists. On the radio today I talked about the DomPost's decision to cancel art critic Mark Amery's fortnightly column. Next week I'm talking at Whitecliffe College of Arts & Design in their seminar series about careers in the art world. I'm going to talk about my own trajectory, but I also want to tackle the question of whether we're currently in a 'golden age' of female leadership in the visual arts, or whether this could be as big a blip as 2005/06 turned out to be, when the five most powerful positions in New Zealand (PM, Governor-General, Speaker, Chief Justice and - sign of the times - CEO of Telecom) were all held by women. 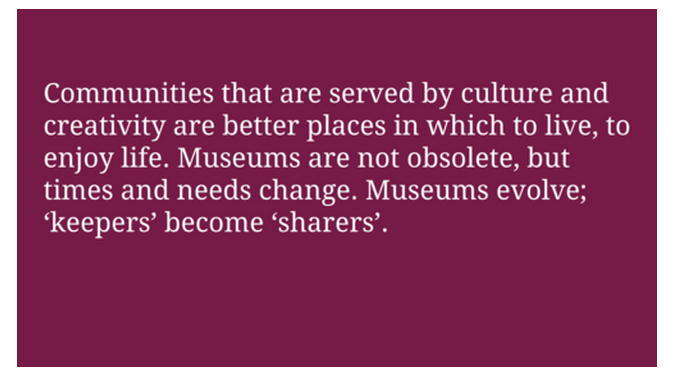 As part of that I'm trying to grok some figures on museum and gallery leadership. For the purposes of this exercise I am focusing on the larger council-funded organisations (not artist-run, CNZ or university) that have been around for 25+ years. I'm also interested in how many women have held multiple directorships across these institutions. Corrections and additions are MOST WELCOME, either in the comments, or via email or twitter. While we're on the topic: an oldie but still a goodie from Over The Net: length of director tenures. People may think I'm London-centric, but that's where the great art needs to be, and here's how the capital's top museums can make themselves more enticing. We need to break up the major museums. That may sound radical to some, but it’s an idea whose time has come. I’m suggesting not that museums sell off their collections but that more museums consider aggressively building outposts or prioritizing longer-term partnerships with smaller or newer institutions that could benefit from such relationships. Behind her sylphlike frame and a gentle voice that doesn't have to be raised to be heard, is a determination forged from titanium: slender, light, but incredibly durable. Why the journalist found the need to include a paragraph that reads like something out of the Drina series is frankly beyond me. "The reason for this is the enormous amount of scrutiny that is actually given to the position of director. Every single bowel movement is reported on," he said, adding that Dr Radford's state counterparts were rarely watched as closely. "The director of [the Queensland Art Gallery] or the director of [the Art Gallery of SA] would have to be seen screwing a dog in the middle of the street during the early morning peak for someone to take notice," Professor Grishin said. A thought-provoking piece by Auckland Museum director Roy Clare published on MuseumID has received the tl;dr treatment from MuseumHack. Either makes for good reading.